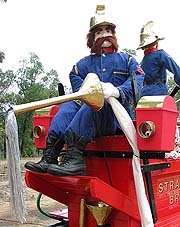 This is the Strawy Fire Brigade scarecrow display -- a replica 1890s steam operated fire engine. 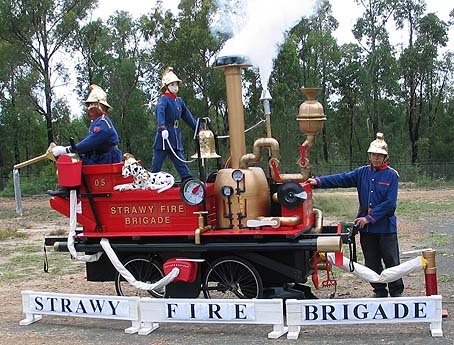 The Strawy Fire Brigade display was animated, with billowing smoke, moving wheels and gauges, bell and whistle sound effects and a steam engine sound track. 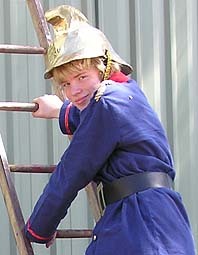 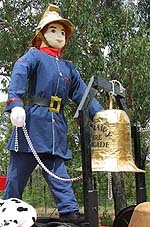 Five scarecrow makers, dressed in replica 1890s uniforms to match the scarecrow firemen, operated the display. 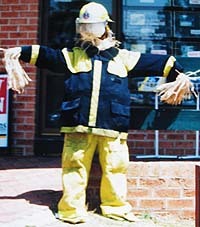 Note: This page includes fireman and firefighter scarecrow ideas for you and your kids to make a scarecrow display with a fire brigade theme.